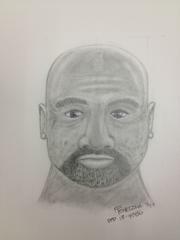 The Davis Police Department has released a composite sketch of the suspect in this case. If anyone recognizes this individual, they are urged to contact the Davis Police Department at 530-747-5400. On October 28, 2013, at approximately 10:30 pm, a male suspect attempted to sexually assault a female victim in the 600 block of Alvarado Ave. near Anderson Rd. The female victim had returned to her residence and parked her vehicle in the parking lot. After retrieving her belongings from the vehicle, she was confronted by the male suspect who forced her back towards her vehicle. Once at the vehicle, the male suspect attempted to sexually assault the female in the parking lot. The female was able to defend herself, which allowed her the opportunity to escape from the male. When police arrived and checked the area, they were unable to locate the suspect. The suspect is described as an African American male, 5’11” tall, weighing 220 pounds, a wide-set nose, bald with a salt-and-pepper beard and approximately 40 years old. The suspect was last seen wearing a black jacket and dark colored pants. If anyone witnessed this incident or has information that could lead to the suspect’s identity, they are urged to contact the Davis Police Department’s Investigations Division at 530-747-5400.